Stanley Martin Lieber was the real-life super hero of the comic book, an American art form invented by Max Ginsberg and a thriving industry already heavily populated by Jewish writers and illustrators when his 70-year career began. 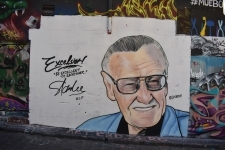 Stan Lee, who ended his triumphant battle for truth, justice, and the American way on November 12, not only brought a distinctly Jewish sensibility to his creations – Spider-Man, the X-Men, Iron Man, Ant-Man, the Fantastic Four, the Hulk, Thor, and many more – but introduced overtly Jewish character and plotlines to his comics. In later years, Lee spoke freely about the Jewish nature of his work and that of many others, beginning with the creators of Superman. Join ACE as we celebrate Stan Lee’s inestimable contribution to popular culture.